Here are some more chords from the G diminished scale. The second column is a diminished triad with a major 7th on top. E.g., B D F A#. 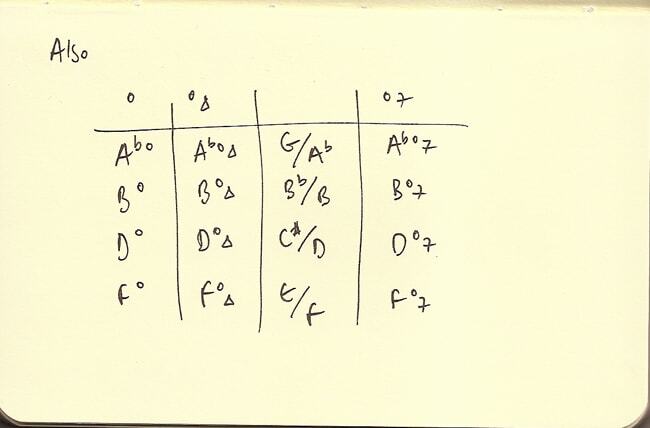 The third column is a different way of writing the same thing: Bb/B – a Bb triad over a B bass note. Whatever works for you. So there are a lot of chords in the diminished scale, eh? There are diminished triads and diminished seventh chords on every degree of the scale. This is one of the things that makes the diminished scale tricky to grasp, and that’s why it’s good to break it apart and focus on a little corner of the sound. It’s tempting to want to learn as much as you can, but I’d advise you to instead focus on finding ONE thing. And then work on it until you make it yours.